White Tara is practiced by all four major schools of Tibetan Buddhism. White Tara has been the main deity practice of many well-known Buddhist scholars and siddhas in both India and Tibet, foremost among whom where Nagarjuna and Atisha. 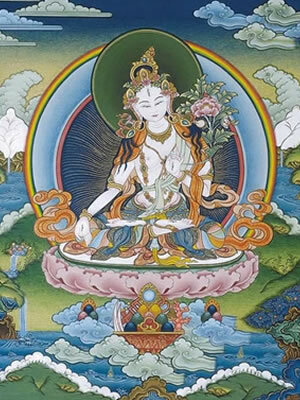 White Tara’s special function is to promote long life, both for the practitioner and for others. 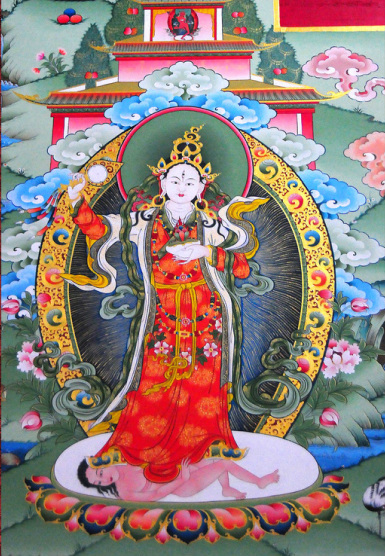 Ultimately, she is the very nature of the dharmakaya, and her practice is a means for attaining liberation. White Tara is a mother figure, seated in the posture of the vajra (thunderbolt) above a white moon disc and an open lotus. Her aura glows, as various colored rings framed with pink lotus blossoms surround her. Her garments are elaborately decorated with ornaments; on her head she wears a sparkling tiara; and she is adorned with beautiful jewelry – a long and a short necklace, as well as various gold and jewel ornaments. Her right hand rests across her knee in the mudra of supreme generosity, while her left hand holds near her heart the stem of a uptala flower, which is blossoming near her left ear. White Tara is always depicted as a peaceful deity. White Tara has seven eyes; there are three eyes on her face (including the one on her forehead) and one eye on each palm of her hands and feet. It is said that White Tara’s seven eyes enable her to clearly “see” all beings in all the realms of existence. Her expression is one of the utmost compassion. Mother Achi was the grandmother of Lord Jigton Sumgon, founder of the Drikung Lineage. To this day she remains a great dharma protector of the Buddha’s teachings. Although Achi has a particular committment to protect the Drikung Kagyu, she is recognized and practiced by all lineages of Tibetan Buddhism. She is the emanation of Vajra Yogini who is the embodiment of the wisdom and compassion of all the Buddhas. She is the divine mother of the Buddhas and manifested out of compassion in the form of the Dakinis of the Five Buddha families. To benefit the beings in samsara, she displays a limitless number of manifestations at different times and in different space dimensions. “Around the eleventh century in Shoto, in the area of Drikung (central Tibet), there lived a family who could not conceive a child. In order to bear a child they made a pilgrimmage to Swayambhu in Nepal. They prayed fervently for a child and one night the woman, Driza Dharzam, had a dream that a brightly shining sun appeared in the east and radiated light in the ten directions and the sun then dissolved into her womb and radiated light which filled the whole universe, especially illuminating the country of her birth. In the same night, her husband Nanam Chowopal had a dream that a rosary of clear white light emanated from the eastern Buddha field and entered the womb of his wife. In the morning they discussed their dreams and he said, ‘a special son will be born to us and we should take much care until this child is born.’ They performed a tsog offering; made strong prayers for the fulfillment of their wishes and then returned to their native land in Drikung. The time came for the birth and an extraordinary daughter was born in the place called Kyetrag Thang. There were numerous auspicious signs and her body was of purest white and radiating rays of light. As a small child she was always reciting the mantra of Tara and at the age of three she was teaching the mantra to others. She grew quickly and was incredibly beautiful. Her parents died when she was quite young and she then stayed with her uncle. Many wanted to marry her but she refused all stating, ‘I will go to Kham (eastern Tibet) and there lives a great yogi who is descended from the noble clan of the Kyura race. This yogi I will marry and our sons and daughters and future generations will be extraordinary persons who will benefit all sentient beings by spreading the essence of the Buddha’s teachings. Then accompanying a merchant, she traveled to Kham. On their marriage day, Ame Tsultrim Gyatso did not have any possessions to arrange for the ceremony. Drolma said, ‘Do not worry, I will take care of it.’ So saying she miraculously pulled a damaru from her right pocket and a kapala from her left. Then beating the damaru and holding the kapala in her hand she made a mystic dance while gazing into the sky. Immediately the house was filled with the finest food and drink and the richest garments with which to clothe themselves – thus giving great satisfaction and pleasure to all the guests. They lived together and in time she gave birth to four sons: Namkhe Wangchuk, Pekar Wangyal, Sonam Pal and Kathung Trushi. These sons were exceptionally intelligent and became scholars on both the temporal and spiritual levels. Of her four sons, Pekar Wangyal gave birth to four sons. They were Khenpo Dharma, Konchog Rinchen, Tsunpo Bar and Naljor Dorje – of these four, Naljor Dorje became the father of the great Ratnashri Jigten Sumgon, the great Drikungpa, who was the reincarnation of Nagarjuna. At a later time Drolma said, ‘I have knowingly taken birth into samsara in order to fulfill my aspirations to protect the teachings of the Buddha and for the welfare of all sentient beings. Because of this, I will grant the ordinary and supreme siddhis to my followers. She led her followers to a huge cave called Tingring. The cave was very sacred, containing many precious termas and many self-created statues of the Buddhas and Bodhisattvas, Yidams, Dakinis, and Dharma Protectors on the rocks inside the cave. A human corpse was brought and she transformed that corpse into a great tsog offering. Those who could partake of that tsog were granted the ordinary and supreme siddhis. Then she composed a text containing a sadhana of herself and promised to look after the teachings of the Buddha in general and to protect the essence of the Buddha’s teaching that will appear in the future. With that she said, ‘My activities through this body have come to an end,’ and she flew up to the Buddha Field on her blue horse without leaving her body. In the Me-Che Barwa Tantra Buddha says: ‘After limitless kalpas in a world system called Pema-Chan, she will become the perfectly enlightened Bhagavan, Tathagata, Arhat, Samyak Sambuddha – whose name will be Pema Dampe-Pal.